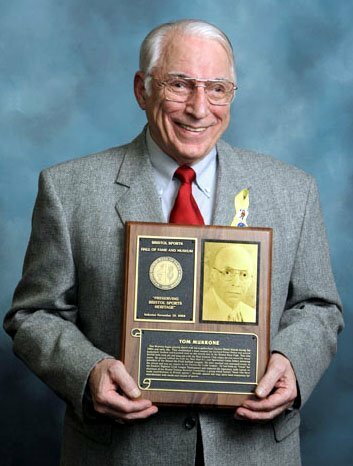 Tom Murrone began playing sports with his neighborhood Gaylord Street friends during the 1930s and early 1940s. They established at team they named the Gaylord Street Hobos and played basketball, football and baseball both on the streets and at the Bristol Boys Club. He also bowled both duck pin and king pin with the West End Athletic Club where he was active for many years. He played softball for both the West End A. C. and Sportsman teams before becoming president of the Bristol Slo-Pitch Softball League. He later coached and managed teams in the circuit and was an umpire in the Forestville Little League. Awards passed his way have been numerous for his contributions both inside and outside of sports.